Anybody any good at interpreting crash dumps? Ok. I'm getting more and more excited about this game so I thought I'd make a thread as, at first search, I can't find one. Obviously I saw the Doc Ock reveal coming from a mile off, they've been teasing that the whole game. But I was NOT expecting a full-blown Sinister Six team-up! I (love to) hate you people. Already tired of hearing how great this game is. Wife is going to murder me, but I don't care... leaving work early, heading out to buy it, and spending a lazy Friday afternoon webbing baddies. Less worried about wife killing me. About the same time I was posting this the wife decided to pull out in front of a Chevy truck and trailer and totalled her car. Yuck. I am sorry. I hope she is ok.
She’s fine, thanks. Bruised her shoulder a bit, but more damage to her pride than anything. Really digging the Halloween vibe the stealth suit puts out. ...may be the best costume in the whole game. On the one hand, Spider-Man is pleading with Otto to stop, but every so often he'll make fun of him. Annnnnnd platinum trophy achieved. My second ever (almost had three this year and they’re all in my top four games). Curious what the DLC will add to the game. I found combat a little too easy, and I’m historically mediocre at Batman combat. I didn’t take a single hit in the last two boss fights. I think this game will settle firmly as my #4 this year behind AC:Origins, God of War, and Subnautica. It’s a remarkable super hero game with a lovely but not overbearing open world feel to it. Combat was decently deep (MUCH deeper than the paltry offering in AC:Origins) but I found it real easy to kite around with triangle, hold square to pop guys up and build combo count. The dodge window was also very generous. The story was compelling and interesting. I loved the character building they did and as a young person in their early 20’s the MJ/Peter Parker interaction was so earnest and natural to so much of what I’ve experienced lately in my life (minus the super powers sadly). My favourite thing about the game was the build up of Otto. Also, the guys at Giant Bomb pointed this out, the semi rendering of open rooms behind windows added so much depth to the world. I think that will be a lasting change from this game in all other games with buildings. I’m still in awe at how they nailed the physics and feel of the swinging and attaching to various points around the world. It just did such a good job conforming to physics! Got extra birthday gift card money than I had expected so grabbed digital from Amazon tonight. Still loving this. I'm at 87% completion. I'm torn about how to approach the end of the game--complete the story now and just clean up districts afterwards, or, to ensure my last experience with the game isn't triggering the zillionth crime that I can cleanup and checking off that box, clear the districts over the next few days and save the story for last? The latter approach might work better with my schedule for the next week or so. 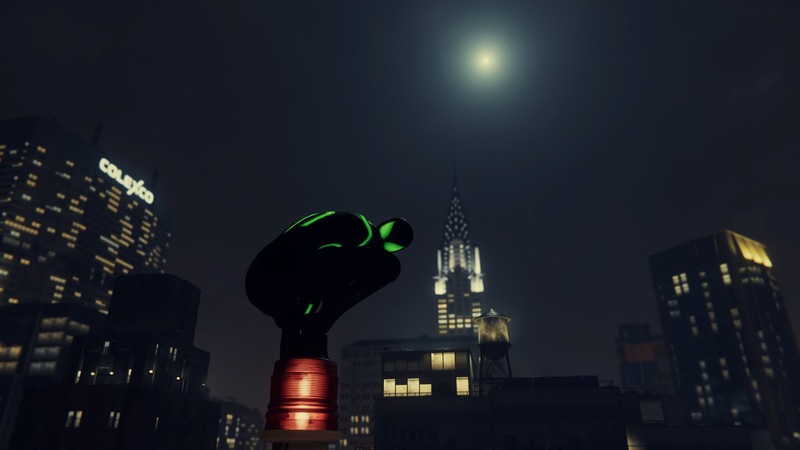 The stealth missions continue to be pretty underwhelming, except I really liked the mission in Grand Central Terminal where you play as MJ directing Peter around. A fun way to keep Spidey involved while giving a different approach to combat. I kept trying to turn my camera to catch Spidey before I'd call him to grab someone, but never could, so I'm guessing they must fake that. Also, after the end of the 2nd act, I was a little disappointed that the two locked items on my maps were all Sable and Prisoner crimes. The crimes are definitely the least interesting side quests to me, so doubling those in the last third of the game is not exciting. Oh well! Looking forward to getting my first real Platinum (I think I have one or two from Telltale games, where the Platinums are literally just for finishing the game). And I hope the DLC is good! Well that opening mission was something. I should have paused and checked the controls. I kept screwing up triangle tap vs hold and wondering why I wasn't doing the zip attack. Would have helped, and on Fisk that icon kept showing. I knew I wasn't doing something right because that fight was harder than it should be. OMG this is so fun. 2 hours just disappeared and I forgot to eat breakfast. Just got landmarks open and can upgrade a bunch of things. I'm all over the place on skills. I started with aerial to get the tricks and then grabbed the first power from the other two that seemed useful. I think I want to get disarm skills next, as guns are rather annoying. Not sure after that where the best bang for buck is. Thoughts? Does anyone know if there's a way to climb down a building from the edge or do you have to jump off & attach on? Some of the bags are down a little from the top of certain buildings & it would be a helpful thing to do. Polygon tips article says you can just press circle on a ledge and Spidey will dodge/flip to the wall below. Need to get back in game to try it. Point Launch Boost makes covering distance over Manhattan absolutely glorious. I use the L2+R2 when flying towards points on buildings & rooftops to grapple towards that point & upon landing time the press of the 'x' button sweet enough & spidey jump propels a serious distance at blistering speed. You dont need to time pressing X for this move. Just do L2+R2 when a target pops up and hit X in advance of landing...boom! There's an upgrade in the skill tree that makes it boost farther, which requires the timed press. The disarm skills were the last I purchased. The thing the game doesn’t tell you is it requires a long hold of triangle to disarm and even then, other guys can go pick up the guns and shoot you. The best bang for your buck is the perk that increases your dodge window. There's also a skill that allows you to do a takedown right after perfect dodging a bullet. This is usually a faster way of taking care of those guys. Hah. Yeah just noticed a thug go pick up the gun after. Very useless. Guess there's not a respec skills option? No, but eventually you get plenty of points. As Aristophan said, you'll get plenty of skill points in this game, more than enough to unlock everything. There's no absolutely no reason to stress about skill choices. Plus, later you'll unlock a skill that lets you web throw the weapon after disarming, which is very useful. Some missions will have bonus objectives for disarming enemies too. Fun fact: I almost never used fast travel, so the last trophy I needed was the one for riding the subway 5 times. I had just unlocked the Undies suit, so I hit 100% by making Spiderman take the train in his underwear. Whoops. A certain collectible has popped up and I abandoned all the story. I must get them all! I did the same thing! Getting on well with the game, but my desire to collect or clear every little side objective is starting to get repetitive. There are good explanations for what is going on most of the time but the way it just a load of icons that populate your mini map after certain points in the game & they are all very similar feels a bit of a missed opportunity to do something much more dynamic. The environmental stuff was a bit better but even the crimes around the city just feel like they repeat all the time, there could have been a bit more thought for different scenarios there instead of the same armed robberies or police stand offs with Fisk's men (& others as the game progresses) or the 20th time I've found a kidnapped pedestrian in the boot of a car. Yeah was meant to say about that, you can get even more distance/speed with the upgrade & pressing 'X' just before you make contact with what your about to land on. Story: What a fantastic ride! As stated before the first act was a little slower than the following two but once that second one hits, man, it really takes off. I thought the Doc Ock and Peter Parker relationship was fantastic. Just being able to see the mans slide into madness, with the hints of a very angry man thrown in here and there before he turns completely bonkers. Introducing Miles was a great touch as well, really enjoyed his relationship with Parker and look forward to seeing where they go from here. Parkers death perhaps? Oh, and the moment the six assemble? Nice. The ending was great as well, I thought it a nice twist that Harry/Norman is possibly going to be the reason behind the Venom symbiote. And now that this world has even more villains established (or will soon be), I'm looking forward to a possible duel spider man (and possibly more?) hero team up. Gameplay: The Good - The city traversal is probably the most engaging I've ever experienced. There was a slight learning curve the first hour or so, but once I got the hang of it, I was zipping through buildings and water towers like a pro. I really enjoyed the weapons and upgrades you gather along the way, even though I really didn't utilize any aside from the basic web shot and the trip mines. The fighting system was very Batman-like, in fact, most of the game reminded me of Arkham and Infamous just mashed together hah. The combos were pretty great and nothing ever really seemed to get boring since you have quite the move-list to work with. Gameplay: The Bad- I really did not enjoy the moments where you play as MJ and even Miles/Peter. The latter wasn't as bad due to not really lasting that long, but the former just seemed to drag on. I think the problem with those parts was that it just wasn't that interesting. I think all of that could have been explained via cut-scene or just left for the player to assume. The only time it worked for me was when the player character interacted with one of the main crew. When MJ and Spider man work together to take out the bad guys was actually pretty enjoyable. And when Miles has to hide from Rhino was a pretty tense moment. But when it was just MJ/Miles hiding/vs. random baddies? Meh. Bases/Crime Challenges got to be a little tedious towards the end. I thought the collectables and pictures were just enough to not drone on. But when looking at the completion percentage, and then realizing in order to get 100% I had to stop Sable, Demon and Thug crimes in each district. It just deflated my ambition to continue once completing the main story arc. Will I still 100%? Absolutely! Because I'm a sucker for punishment and the traversal is awesome. Will I enjoy it? Eh, most likely not all of it. It's just time consuming and tedious. With all the great things about this game and the minor missteps aside, I cannot recommend this experience more. It's such a fantastic ride through and through. Especially for a comic book fan. 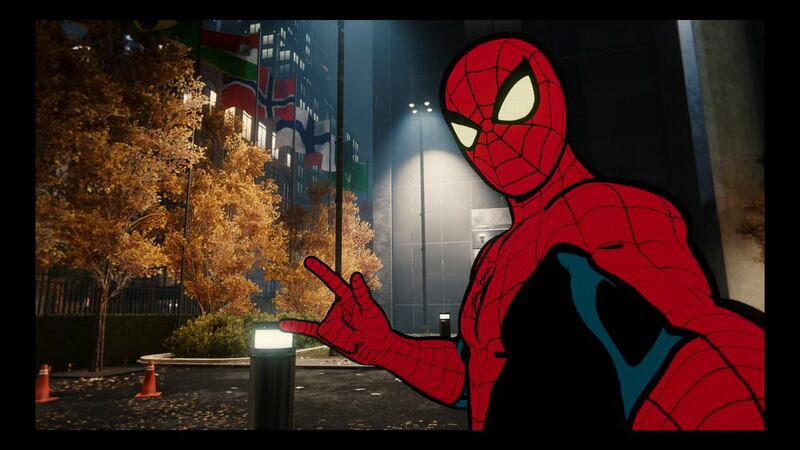 The slight nods to other characters, and what we are left with to look forward too in a sequel, means its a great time to be a fan of Spiderman and gaming in general. Wife ended up staying in bed with her car wreck-bruised shoulder/ego all weekend. So, other than running my oldest daughter to/from work and occasionally getting "the littles" some food, it was a long Spider-man weekend. I think I'm about 85% done with the main story and roughly 50% with the collectibles, side quests, etc. Game is very derivative of Assassin's Creed and Arkham Batman games, but the cutscenes are perfectly spaced to keep the great/interesting story moving along. I will say all the base and crime objectives are a bit redundant. All of the skills, suit powers, gadgets, etc., were a great inclusion for what would otherwise also be a redundant and derivative combat system. Once you get enough to really start to mix-match different skills, powers, and gadgets, it's interesting to see what sort of combos you can come up with. Overall, I much prefer Spider-man to its "parent" games. I love this game. So much fun. So much positive energy. I love it. They nailed Peter Parker. I like that guy. September seems to be a great month so far. With this, Destiny 2: Forsaken, and Dragon Quest 11. I don't love the way New York becomes such a crappy place in the third act. Granted, this is a city where someone is engaged in some sort of crime every 30 seconds or so, but between having random snipers littered throughout the city now and the art change (I am perceiving correctly that, in act 3, it's always either night time or rainy and dreary during the day, right? this isn't random?) it's no longer the same kind of feeling where I feel like I could be Spidey swinging through the city forever. It's forgivable--I assume things will return to normal once I finish the story?--but it is wearing on me a bit.